Do you have a dinosaur lover on your gift list this year? I know I sure do! If you are looking for the perfect gift for them, you might want to consider Playskool Kota & Pals Stompers. We received a Triceratops Stomper to review and I was very impressed. 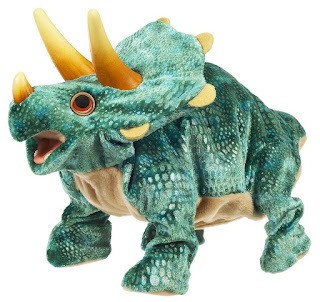 The dinosaur stomps around, makes dinosaur noises, and even throws it's head back! I don't know what child would not enjoy playing with this adorable toy. My entire family, me and Dan included, had a blast playing with this guy. Toys have come such a long way, we never had anything this cool when we were little! Kota & Pals Stompers are recommended for ages 3 years old and up. They require three “AA” batteries, which are included. You can purchase them at most major nationwide toy retailers or online at HasbroToyShop.com for $24.99. I think it's a great price for a toy that would be a huge hit with the preschool set this holidaty season. Ramblings of a Texas Housewife Product Review and/or Giveaway Disclosure- I have received no compensation from Hasbro other than the offer of free product to review and/or giveaway. Any opinions expressed on Ramblings of a Texas Housewife are my own. My reviews are never reviewed or edited in any way by sponsors.